Makeup artists know all the great tricks when it comes to product knowledge and this is the one product every makeup artist has in their kit. It's always inspiring to know what's in every makeup artist's kit. We know all the must-haves as opposed to the nice-to-haves. We know the products to use to achieve a perfect look every time. Discover the six makeup artists you need to start following on social media. It can be a challenge, figuring out what essential products to buy. Some simply are better than others. Then, some are an absolute must in everyone's makeup bag, not just MUAs'. 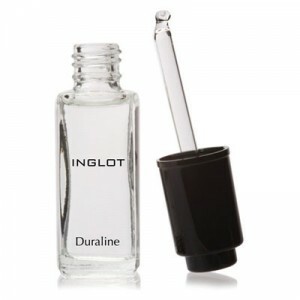 Inglot Duraline is one of these. Read these three makeup artist tips for more wide awake eyes. This is one of those products that you would walk past and never know you need it unless someone has told you about it. It's inexpensive and really useful for all your makeup needs. This hypoallergenic waterproof liquid has countless uses. To start with, you can mix it with your foundation to make it water resistant in a wet or hot climate. You can use it as an eyeshadow base and it will intensify the colour of any shadow and hold it on for longer; it adheres pigment really well. It can be added to lipstick to liquify it and make it water resistant, to dried up gel liner, mascara and lipsticks that need rejuvenation. There is just so much you can do with this wonder product; it's no wonder makeup artists can't live without it.